No outcries for Thursday’s dinner — a quickie of lentils & sweet potatoes in the pressure cooker with catfish broiled in the oven. Son #1 gave it a thumbs up; Son #2 just shrugged. He’s not much on fish of any sort. I was happy because I took a couple of shortcuts with Emeril Lagasse’s recipe. Instead of fetching fresh thyme from the garden in a driving rain, I opted for dried. 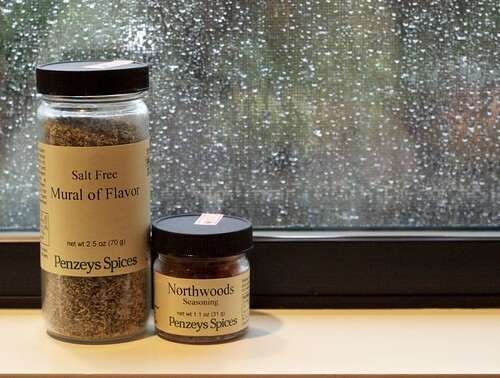 And mixing up Emeril’s “Essence creole seasoning” seemed like an unnecessary hassle when I remembered I had a new blend from Penzeys tucked away in a spice drawer. Good decision! I discovered Penzeys spices only a year ago when a dear friend from Cleveland sent a small sampler box as a holiday gift. Included was a small jar of Mural of Flavor, a name that struck me as strange until I finally opened the jar sometime last fall. Then, suddenly, Mural of Flavor vanished. I sprinkled it on EVERYTHING: eggs, veggies, potatoes. So I was delighted to learn a couple of months ago that Penzeys had opened a store in Seattle. We found it near Pike Place Market — a low-key storefront in a historic block. Though I had only minutes to shop, I managed to restock on MoF (this time in a larger size), assemble a sampler for my grill-loving brother and pick up the Northwoods blend … which made its way onto our catfish last night. Now I’m hooked on a second seasoning blend. I can foresee another trip to Penzeys sometime soon. In fact, it sounds like a great rainy day destination! 2 Responses to "A shortcut to flavor"
I love Penzeys, but haven’t visited the website in a while — thx for the reminder! Do you have a store nearby? The retail experience is quite different from the catalog and website — interesting from a branding perspective!